New entries: Recent new additions include aspiration hazard, hazard not otherwise classified, product identifier, and signal words which are all terms covered in the lastest HazCom Standard. Target organ effects also got a big update with info on STOT-SE and STOT-RE. Recent updates: We have been working to ensure that our entries feature the most recent information consistent with the HCS 2012 which took full effect in June of 2016. Thanks for your support! This hyperglossary is used hundreds of thousands times each month! If you're interested in advertising here, send us an email!. Try our MS-Demystifier. Paste your HTML or text-based SDS into it and every technical term will be replaced by a hyperlink to the appropriate entry in our SDS HyperGlossary. You can save and/or distribute these sheets and it's FREE! Safety scoreboards to create a culture of safety. SDS binders. English or bilingual English/Spanish. Several sizes. Bulk discounts. 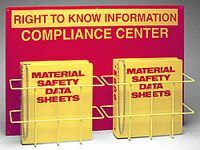 SDS compliance centers and stations. We carry over 100 kinds of fire extinguishers. 400,000+ MSDS's on this mobile pocket hard drive and we have other great software as well. Dozens of fire extinguisher signs, tags, cabinets, recharge agents and more. 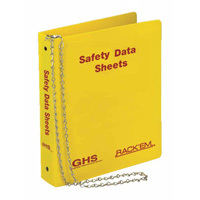 Lockout/tagout supplies, kits, handbooks and training materials. A complete line of eye washes, safety showers, combo units, signs, tags and more! Safety banners up to 10 feet long. Matching signs and lapel pins are also available. ** = includes an on-line unit conversion calculator. New entry suggestions? : If you have any MSDS terms you'd like to see defined, please feel free to contact us via email.